> Schneider Electric > Is Reliable Power a Priority? Facility and operations managers have many priorities to ensure business objectives are met. Key to managing these is the realization that a safe, reliable power system should rank high on the priority list. However, as organizations streamline personnel and budgets, many don't have the inhouse resources or expertise to maintain - let alone optimize - the system's electrical assets. 3) identify opportunities to modernize, improve performance and help protect employees. Investing in a power system assessment that focuses on moderization, performance and safety yields short- and long-term savings. In fact, the cost to restore power to operations from one unplanned power outage could easily surpass the cost of a power system assessment. 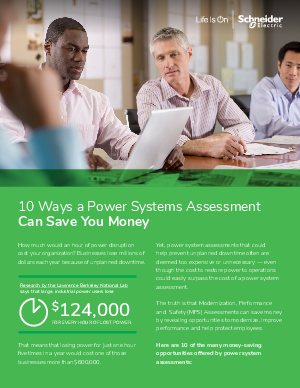 To learn more, download the checklist, "Ten Ways a Power System Assessment Can Save You Money".